People who grow (or at the very least, keep) their fortune aren’t focused on the things they can buy, but instead, they’re focused on what their money can support. 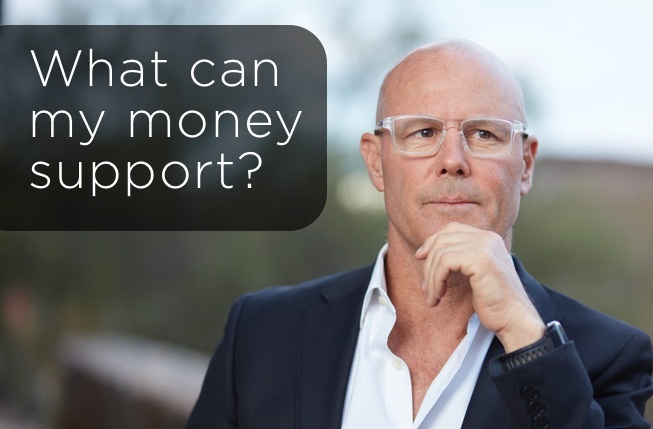 In order to understand what money can support, a completely different mindset must be in place. The lavish lifestyle most people think they can live after coming into sudden money — with the cars and the mansions and the dream vacations — won’t last as long as they think it will. However, $10 million can support you for 25 years if you’re living on $400,000 per year (assuming $240,000 after taxes). Having passive income like this frees up your time so you can focus on things you actually want to do, instead of engaging in the rat race of needing earned income in order to survive. You could start your own new business venture and create your own dream job. You could make calculated investments in others’ new businesses and collect new wealth. But if you were to take that $10 million and start spending it at a rapid rate, you might be left with only $5 million. If you were to live on that same $400,000 a year, you’ve now cut the life of your sudden money in half. You’ve depleted the principle and you’re on your way to being poor. Let’s say MC Hammer spent $2 million each year on his lifestyle, as well as taxes, and invested $16 million. After three years, his $16 million per year savings would’ve turned into $48 million, an amount guaranteed to generate returns forever, if invested wisely. Examples of wealthy people who’ve managed their money well aren’t as easy to come by. It’s not usually smart, sensible people who steadily grew their fortune who end up trending on Twitter (with one notable exception). It’s the MC Hammers and the Johnny Depps of the world who make the headlines for being insanely wealthy and somehow end up declaring bankruptcy. But those success stories are out there, too and they’re just as important to read. Lou Grubb was an automotive icon in Phoenix, Arizona. After relocating from Long Island, New York in 1945, Grubb established himself as a frugal businessman in the automotive industry. He founded Grubb Automotive, which expanded over the years to eventually include multiple dealerships featuring cars made by Chevy, Ford, Hyundai, Toyota, Nissan, Mazda, Saturn, Suzuki, and Buick. The reason Lou was able to build his automotive empire was that he was fiscally disciplined. Early on in his career, he was a manager of a car dealership with three other men. Everyone earned a fair amount of money, but the other three were living pretty large, buying cars and big houses. When the owner of the dealership wanted to sell the business, Lou was the only one who had money. Lou bought the dealership and the other three men ended up working for him. And of course, that was only the beginning. He purchased eleven more dealerships over the years and ended up selling the business in 1997 for a fortune. While Warren Buffett didn’t come into sudden money (he slowly built his wealth over the course of decades), his mindset about money is one we could all learn from. A child of the Great Depression, Buffett was always a frugal man. He built a house in Omaha, Nebraska early on in his career that he still lives in. He’s always made carefully calculated investments and acquisitions and is now worth over $84 billion. But Buffett cares about the game, not the money. He doesn’t buy things that don’t produce for him. He makes investments when he purchases something, which means the fancy cars and yachts aren’t on his wish list. Instead, he focuses on his competition, his experiences, and his legacy. People like Buffett know that real wealth is not measured in the things you own, but in the amount of time that is actually yours. Similar stories can be told about successful business entities. For example, Apple, Google, and Berkshire Hathaway all have massive amounts of liquid assets (assets easily transformed into cash) available to them at all times. Why? They know revenue will bob up and down. They know the market fluctuates. At some point, there will be a downturn and they want to be prepared. While these companies suffered setbacks during the most recent recession, they were never in danger of closing up shop. The rich — whether individual or incorporated — appreciate liquidity. They understand it rains in the summer and that there will be a drought at some point. The bottom line is that you need to take the structure of a stable business operation and incorporate it into your personal life.